If you have ever tried a subscription box company, you know how agonizing it is to wait for your box of goodies to arrive and the excitement you feel when it finally does! For me, it feels like Christmas or my birthday every month when something just for me appears in the mailbox. As a mom, I don’t get many things that are just for me, so it’s a very special treat to get a box with my name on it every month filled with surprises. The first box that I am reviewing is something that I tried out for my five-year-old son. He is not really into reading yet, but he loves to build things, so I tried out KiwiCo’s monthly crate. They offer five different crates depending on your child’s age. The crates range from 0-16+ years of age. We got the Kiwi Crate, which is geared towards children ages 5-8. Each box is around $19.99 per month plus shipping. Each month, they receive a hands-on project that explores art, science, and engineering. The project this month was a handmade claw kids can use to pick up items, similar to the claws you see in arcade games that pick up toys. The crate comes with all the materials to complete the project and thorough instructions easy enough for kids to understand. Since my son was on the younger end of the age range for this box, he still needed some assistance with reading the instructions and putting it together. As you can see, he had a lot of fun building it and can’t wait for the next box! If you would like to subscribe, please use my referral link, and you will get a $10 credit! If you have never tried or heard of Owlcrate, it is a monthly subscription box that features a brand new Young Adult book as well as 4 or 5 bookish goodies. Each box has a theme and this month’s theme was “Summer Lovin'”. What’s better for a summer themed box than a beach towel?? The thing I love the most about Owlcrate is that they surprise me every month with unique items that I have never seen before. This microfiber towel is great for the beach, pool, or just a lounge chair on your deck. This was created exclusively for Owlcrate by Stella Bookish Art. Please go take a look at her page. She has a ton of wonderful, beautiful bookish items to choose from. Since I am from the South United States, I love my sweet tea. The mason jar mug included in this month’s box is perfect for my ice cold sweet tea, and it couldn’t have come soon enough, because we are in the thick of those 90-100 degree days down here! The mug was designed by Michelle Gray and Team Owlcrate! The woodmark is inspired by Aristotle and Dante Discover the Secrets of the Universe by Benjamin Alire Saenz. It was designed by Ink and Wonder Designs. Go check out their website. They specialize in 100% ethically sourced and sustainable, “woodmarks”, as they call them. They have woodmarks made from maple, cherry, oak, and Eastern red cedar. In addition to woodmarks, they have tote bags, pins, stickers, and other accessories. I am always so excited when Riddle’s Tea Shoppe is featured. I have tried a few of their teas, and they never disappoint! The tea in this month’s box is inspired by Since You’ve Been Gone by Morgan Matson and has an apple flavor. This tea was made exclusively for Owlcrate, so it won’t be available on their Etsy page, but they have other bookish flavors as well as bookmarks, pins, and prints. The cactus pen is the cutest, and was created by BC Mini. The featured book this month is a YA contemporary, which I don’t read a lot of, but I am looking forward to reading this one, as most featured in Owlcrate are pretty good. The title is From Twinkle, With Love by Sandhya Menon. It sounds like a great light summer romance perfect for beach or pool reading out in the sun! As always, the book is signed by the author and includes a letter to readers. 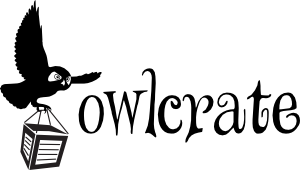 If you would like to try Owlcrate, please use my referral link! Stay tuned for next month’s unboxing post. I will be reviewing a paranormal puzzle box! Yes! I enjoyed it as much as he did!